After a drive of over 1100 km from London, Amma arrived in Berlin in the wee hours of Friday, October 25th, the same day that her program there was to begin. Nevertheless, Amma was right on time for her first program at the Velodrom, which at 35,000 square feet is one of Berlin’s largest halls. 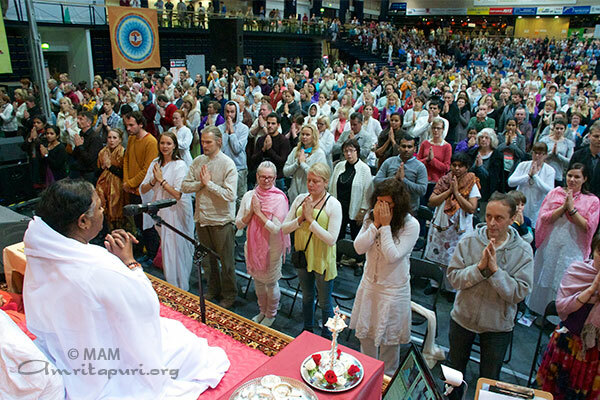 Though it was only the second program in Berlin, the love and dedication of the local devotees was quite evident, and it seemed to overflow from their lips in harmonized strains of “Om Lokah Samastah Sukhino Bhavantu” as Amma entered the hall on the first morning. The throngs of Berliners who filed through the entrance doors that day apparently shared the same feeling, as they sat in rapt and silent attention in the hall, waiting for their turn to bask in Amma’s embrace. One could not help but notice the stillness pervading the space, as well as the quiet, orderly manner in which the program attendees flowed through the darshan cue. After Amma stood up from her chair at the end of the first day’s programs, before going to her room she broke into a traditional dance to a joyous melody, as the audience burst into gleeful applause and excitement. There was also quite active participation in the Berlin program by devotees of neighboring countries. 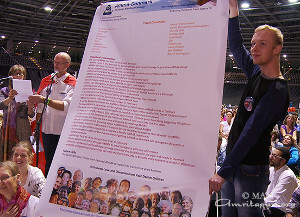 Polish devotees repeatedly brought home-grown squash, engraved with the words “Amma – Please come to Poland!” During the final night’s program, a sizeable delegation from Denmark first presented a long list of reasons why Amma should visit their country, then segued into devotional songs punctuated with fervent pleas to further their cause. 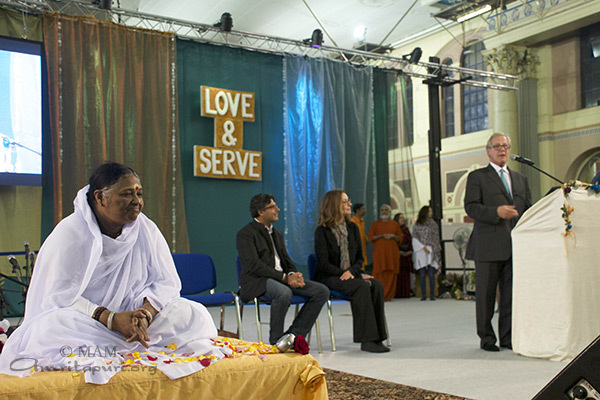 All in all, Amma’s second Berlin program was filled with an air of celebration and delight. As Amma’s vehicle pulled out of the massive Velodrom complex, she left the devotees with countless precious memories, and set out to carry a tidal wave of love and joy to the next destination – the Netherlands. 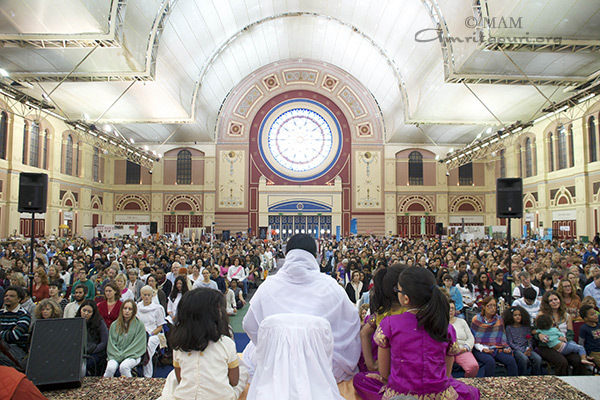 Amma was accorded a grand traditional welcome on Her arrival in the famous Alexandra Palace. 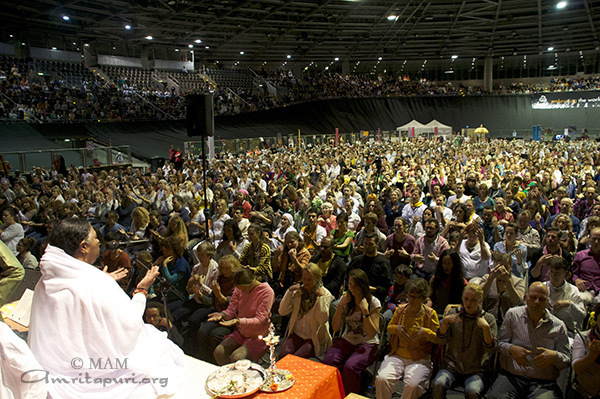 People from all over the United Kingdom had gathered to welcome Amma for the twenty-sixth time. Others who welcomed Amma were the famous screenwriter of the Bafta Award winning documentary, “Senna”, Mr. Manish Pandey, and Ms. Taylor Thompson, philanthropist and member of the Thompson Reuters Board. 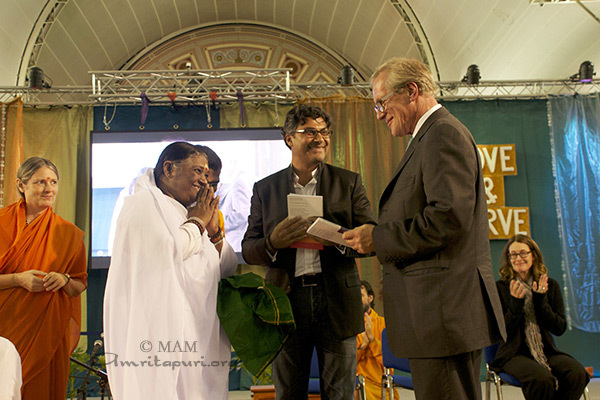 Mr. Pandey performed the European release of the book “The Colour of the Rainbow”, authored by Swami Amritaswarupananda, and Lord Stone received the first copy. The book focuses on the compassionate approach to leadership, as exemplified in Amma’s teachings. Amma’s visit to London was also covered by the One Show, a daily television programme broadcast on the BBC, attracting on average an audience of 5 million viewers. After the interview, “Pudsey Bear”, the mascot of BBC’s ‘Children in Need’ charity, came for Amma’s hug, to a thundering applause from the audience. Amma’s darshans went on for long hours throughout the three-day programme, as people kept streaming into the venue all the time. The cultural programs of music and dance were a beautiful blend of East and West. As Amma got up after each darshan, it was such a joy to see the devotees gather all the way along the long corridor to the exit, and Amma playfully interacting with all of them. 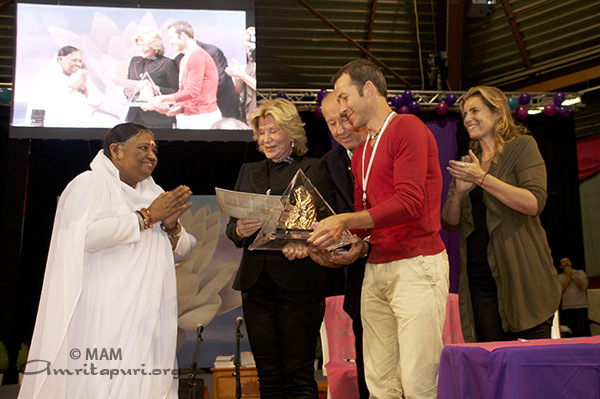 Paris has always been one of the most crowded of Amma’s programs in Europe and keeps growing with every year. 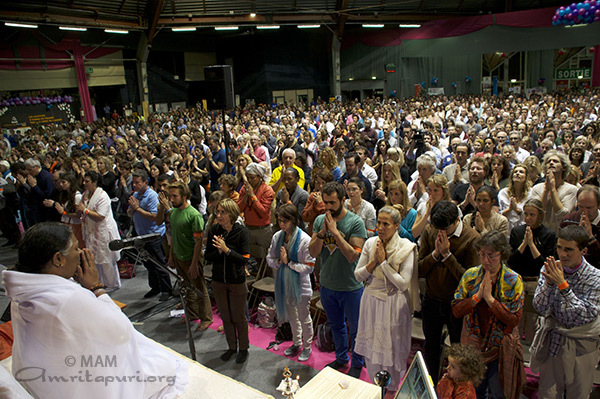 The venue ‘Hall Saint-Martin’ at Cergy Pontoise remained full throughout the three days this year as well; Parisians were ready to wait for hours and hours for their turn to meet Amma. Previous laureates of this award include: Prince Albert of Monaco, Philippe Pozzo de Borgo, Alain Bougrain Dubourg, and Tony Juniper. Amma’s rendition of ‘Nirmala Snehame’ (one of Amma’s Malayalam bhajans) in French brought tears into the eyes of many in the crowd. Amma said in one of Her talks, “There are many types of powers in this world—intellectual power, military power, financial power, political power and power of written word… But the greatest power in the entire universe is the power of love.” This was so visible during Amma’s Paris program. One could see Amma’s love filling all hearts. One could also see the love in the hearts of hundreds of volunteers who were ready to serve without thinking of their own comforts or rest, simply desiring to be in the service of Love. 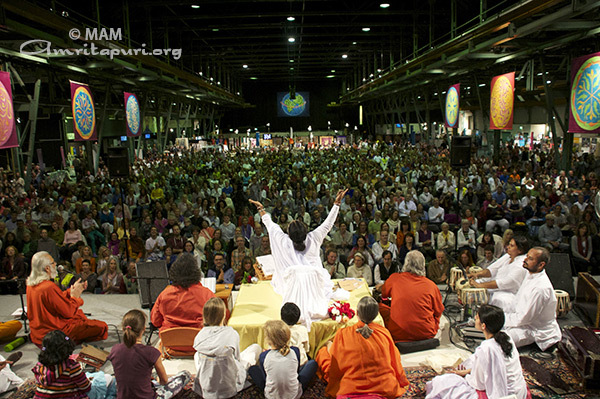 Zenith Halle, the venue of Amma’s program in Munich, was brimming with joy as Amma entered the hall for darshan on the first morning. As she walked to the stage through arches made of leaves held by devotees dressed in traditional Bavarian attire, the choir sang Happy Birthday, commemorating Amma’s 60th Birthday. The whole crowd sang along. 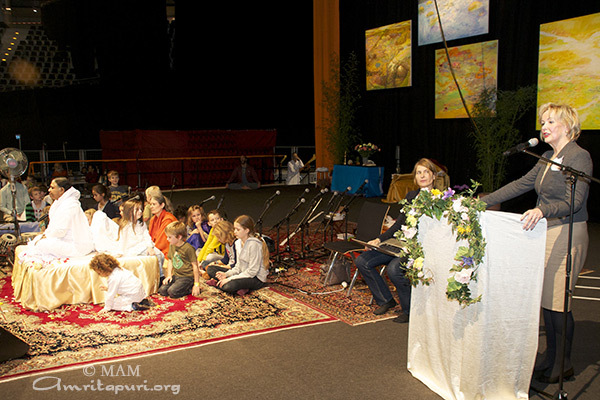 Amma started Her talk on the first day saying, “When Amma sees all her children sitting together, it feels as though Amma is standing in a large garden, where flowers of different colors and fragrances together spread a unique perfume.” It was so true as the four-day program in the Bavarian capital was truly a confluence of devotees from not only Germany but also Austria, Croatia, Hungary, Poland and Slovenia. As Amma gave her talks, the screens showed the simultaneous translations in different languages for the benefit of these devotees. Most of them extended their heartfelt invitation to Amma to visit their country. The second day program also coincided with Vijayadasami, the day when Navaratri (the nine day worship of the Divine Mother) concludes with the Saraswathi puja (worship to the Goddess of Knowledge) when children are initiated into letters (Vidyarambham). For those who have already begun to acquire knowledge, it is a reminder that only one who can maintain the attitude of a beginner will be able to learn. The devotees were overjoyed as Amma led the initiation into letters on the morning of the second day, with the chanting of “Om Hari Sri Ganapataye Namah” and the Sarasawati mantra. Like every year, the Munich program was studded with vocal and instrumental performances of Western classical music by eminent artists. 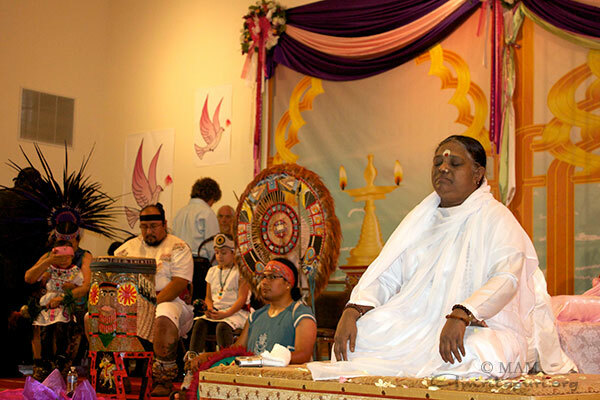 The local satsang groups from the different countries also performed for Amma. On the final day, as Amma got up after darshan in the early morning hours, the hall was still full of people. They joined in the shout that was led by Amma, “Mata Rani Ki Jai” with their hearts filled with gratitude. Amma was accorded a warm welcome by her Swiss children on arriving from Helsinki at the Zurich airport. The venue of the program was the same as the last few years at the Eulach Halle in Winterthur. 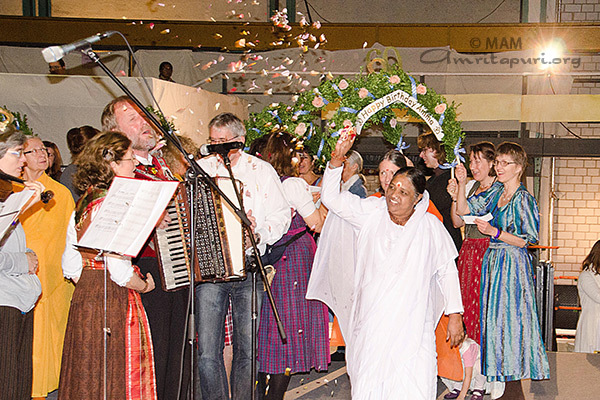 As Amma arrived at the hall, she was given a traditional welcome by the devotees playing a Swiss Alphorn and bells. There were some exquisite cultural programs that were held each day, which were thoroughly enjoyed by one and all. Apart from the Western classical music performances by distinguished artists, there was a dance presented by Amma’s children belonging to three generations, offered as a token of gratitude to Amma for having come into their lives. This dance was also offered as their gift to Amma on the occasion of Her 60th Birthday, which was just 10 days before. 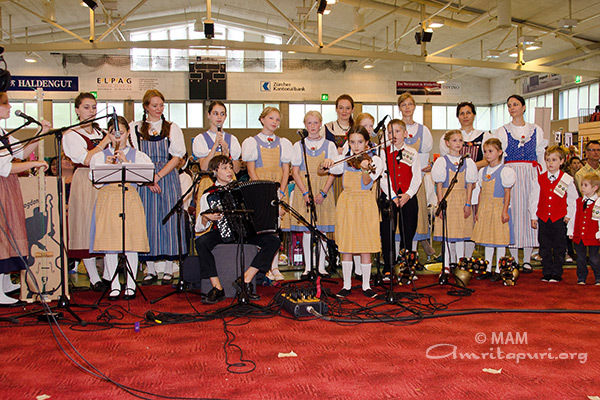 Another highlight was the Swiss folk songs presented by children again from different age groups, which gave a glimpse of the life in the beautiful Alps and talked about peace, love, and humane virtues. The next stop is Munich. Prem kin nadiya bahti jaye…..the river of love continues to flow. Amma to visit San Ramon and Detroit in the month of November. She will hold programs – Satsang, Bhajans and darshan – in these two cities of America from Nov 18 – Nov 29. 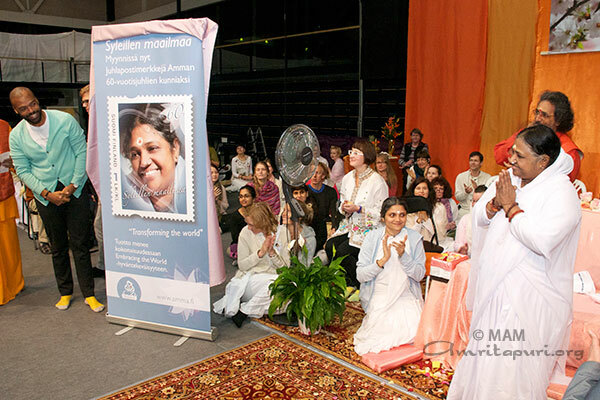 “Welcome Amma to Suomi (Finland)” was the call from many of Amma’s children who had gathered at the Helsinki airport to welcome Amma to Finland, the first stop of her European Tour 2013. The two day programme in this beautiful Scandinavian country was held at the Energia Arena in Vantaa in which thousands participated. 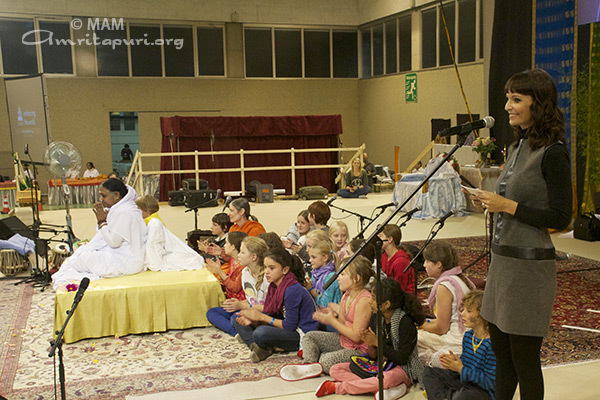 Amma delighted her Finnish children with the Finnish rendition of “Nirmala Snehame,” one of Amma’s Malayalam bhajans. The audience clapped in joy as Amma finished the song. During darshans there were musical performances by renowned artists Annilina Ahven, Olavi Uusivirta, Katri Ylander, and Matti Salovaara. At the end of the first day’s darshan, Amma’s Finnish children also brought a beautiful cake to Amma, wishing her a Happy 60th Birthday. Amma cut the cake into many pieces and made sure that all her children present in the hall got a piece of it. On the occasion of Amma’s visit, a postage stamp of Amma was released on the morning of the second day by Mr. Jani Toivola, honourable Member of Parliament. The stamp commemorating Amma’s 60th Birthday and with the message ‘Syleillen Maailmaa” (Embracing the World in Finnish) has a beautiful photo of Amma on it. 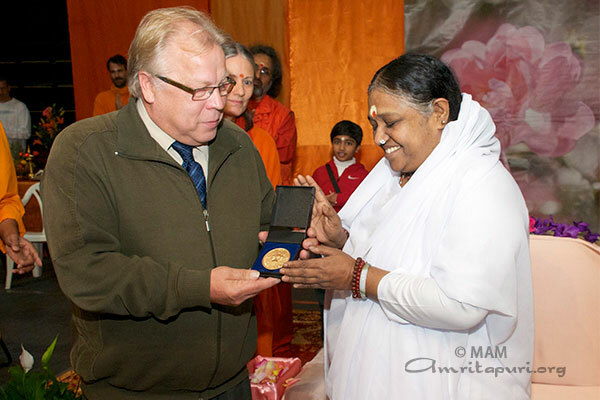 Speaking on the occasion, Mr. Jani Toivola expressed his happiness on being able to see Amma once again and expressed his deep appreciation for Amma’s work that creates opportunites and platforms for people, especially the youth, to feel empowered. 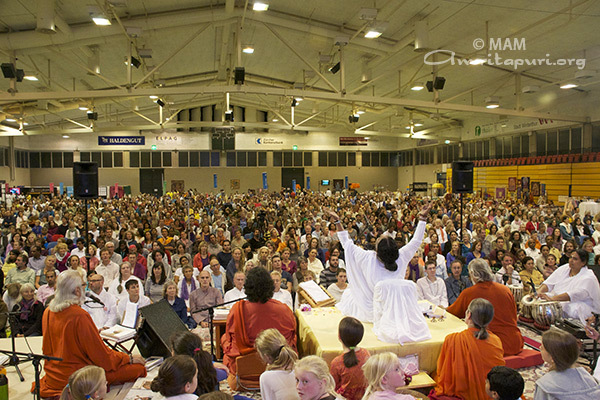 The Arena was completely packed for the Devi Bhava which went on till the early morning hours. During the night filled with the devotional bhajans led by the swamis and the local satsang groups, there was also the soulful rendition of songs by the famous rock band Von Hertzen brothers, which enthralled one and all. As the end of the Devi Bhava neared one could see the glimpses of happiness mixed with sadness on the faces of her Finnish children. Happiness because of being with Amma and sadness because of the thought that they have to wait till 2015 for Amma’s next visit to the country.